His solo albums are Closer Still (1995), It's All Good (2005) and Above The Clouds (2007). His newest album is entitled South Beach and is scheduled for release August 31, 2010. Brian allured some of the finest contemporary jazz artists for his new project. George Duke, Peter White and Euge Groove are the featured guest-musicians. A lot more musicians participate in Brian's recording such as Tony Moore, Michael White, Oscar Seaton (drums), Alex Al, Smitty Smith, Larry Kimpel, Ian Martin (bass), Agape Jerry, Darrell Crooks, Yarone Levy (guitars), Brian Kilgore, Lenny Castro (percussion), Ron King (flugelhorn), Steve Alaniz (sax) and Brenda Kay Pierce (vocals). On the breezy Can't Tell You Why Brian expands his mastery on keys in a lyrical journey. Ron King adds melodious lines on flugelhorn. Euge Groove is best known for his strong relationship to the audience. Lay It On Me explains why. Never Without You is the great stage for Peter White, one of today's most impressing acoustic guitarists worldwide. The lovely ballade also featured saxophonist Steve Alaniz in a prominent role. Finding the last heavenly resort is mankind's dream. Paradise Island is Brian Simpson's personal interpretation of this eternal wish. Old friends is George Duke's goodwill visit on Brian's album. While Brian takes the lead on piano, George adds an awesome line on synthesizer. Because of its wide range and the clear sound is the piano a favorite instrument of many keyboardists. On All I Want Is You is Brian's piano the star. With a bright reverb he opens some sonic ambiance and space. Brian continues this style on Our Love, but gives the lead to Yaronne Levy's fabulous guitar performance. Steve Alaniz and Brian go on with a dazzling duet of their instruments. Summer's End contributes some jazzy and moody melancholy to the album displaying Ron King on muted trumpet. When the moonlight illuminates the sea, you can experience a moment of unreal beauty. Ron King's trumpet transfers the gloomy vibes of Moonlit Ocean. 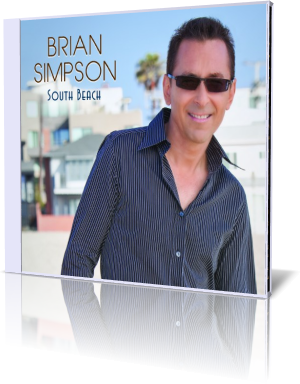 South Beach is Brian Simpson's most ambitious album so far. With the piano as most expressive instrument in the foreground, hooky and emotional melodies and an array of top notch musicians he can't go wrong. This album will be beyond doubt a chart topper.